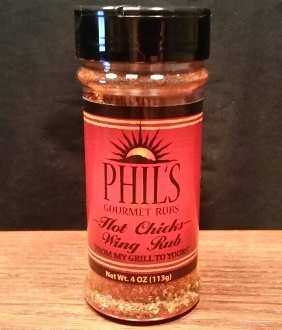 REVIEW: Phil’s Gourmet – Hot Chicks Wing Rub – I Love It Spicy! Welcome to Phil’s Gourmet Sauces where southwest flavors meet BBQ sauce. I created a unique but traditional line of Barbeque sauces that will enhance your grilling experience. Sauces that still have that traditional barbeque flavor but have some unique flavors. My sauces range from a sweet Honey Apple grilling sauce with chunks of apple to a traditional sauce that is excellent with anything you choose to grill. I’ve combined locally grown sundried red chili in all of my sauces to get that unique spicy taste. What I’ve done is create barbeque flavors that go well with specific grilling meats, whether it’s my Honey Apple/Honey Apple Hot grilling sauce on a slab of baby back ribs or my Chipotle grilling sauce on a crispy smoked brisket. I’m sure you’ll find these sauces an excellent choice on whatever you choose to grill… Phil’s Gourmet Sauces is not responsible for any family and friends that won’t leave after the barbeque. All of my sauces with the exception of the Traditional are HIGH FRUCTOSE CORN SYRUP “FREE” and low in the calorie department so heap it on!!! Had wings with this rub at Fiber Joe’s BBQ after the Friday Fiery Foods show – really, really tasty with a very subtle back-end lingering heat. I loved them and would definitely purchase this product. Highly recommended.